Joe Turner's undefeated homebred Sircat Sally seeks her seventh consecutive win as she heads a field of six 3-year-old fillies in Saturday's Grade II, $200,000 Honeymoon Stakes at Santa Anita. Chief among her opposition are lightly raced Pacific Wind and Irish-bred Beau Recall, who were separated by a head when finishing third and second behind the top selection in the Grade III, one mile turf Senorita Stakes here on May 6. A California-bred daughter of Surf Cat, Sircat Sally is out of Turner's In Excess mare Sister Sally. Following her first-out maiden score on Nov. 20, she's annexed five consecutive stakes, the last two being Grade III events. 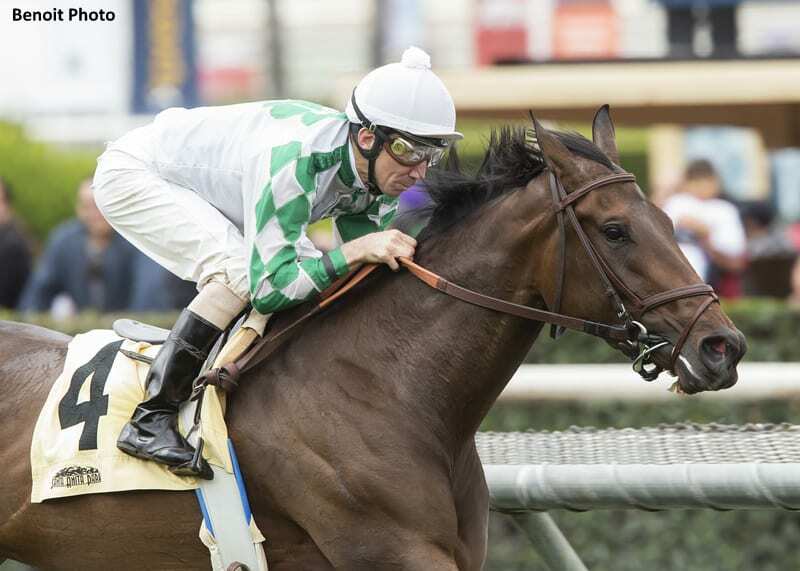 SIRCAT SALLY: Trained by Jerry Hollendorfer and blessed with a front-running style, she made every pole a winning one in the Senorita and in the Grade III, mile and one eighth turf Providencia Stakes two starts back on April 8. Favored in her last five starts (four of them odds-on), Sircat Sally, who defeated Beau Recall by 1 ½ lengths in the Senorita, is unbeaten in her only try at the Honeymoon distance and looms strictly the horse to beat on Saturday. Her six wins have produced earnings of $408,860. PACIFIC WIND: Trained by Peter Eurton, this lightly raced Kentucky-bred filly by Curlin fetched $200,000 as a Keeneland September yearling and was an impressive first-out open maiden special weight winner going a mile on turf March 4. In only her second career start, she was attentive to the pace and just missed second money in the Grade III Senorita Stakes, as a fast finishing Beau Recall nipped her by a head on the wire. Given her lack of seasoning and the fact she was back in front of Beau Recall on the gallop out, Pacific Wind has every right to improve stretching out a furlong on Saturday. Owned by Sharon Alesia, Ciaglia Racing LLC, Peter Brant and Dominic Savides, Pacific Wind has earnings of $44,400. BEAU RECALL: Trained by Simon Callaghan, this Irish-bred has displayed a solid turn of foot in all three of her stateside races. A winner of her U.S. debut three starts back in a one mile turf allowance on Jan. 29, she was a fast finishing second in the one mile turf China Doll Stakes on March 11, a race in which she fell far back of the early pace. With a win from two starts in her native Ireland, Beau Recall will be trying a mile and one eighth for the first time and would be well served if Pacific Wind or perhaps fellow Irish-bred Zaffinah can apply early pressure to the top selection. Owned by Slam Dunk Racing, Beau Recall is 5-2-2-0 overall with earnings of $79,877. This entry was posted in Racing and tagged honeymoon stakes, Horse Racing, pacific wind, santa anita, sircat sally, thoroughbred by Mike Willman/Santa Anita. Bookmark the permalink.